In the perspective of coupling efficiently a nano-emitter to a photonic structure, the knowledge of the emitter orientation is necessary. It is also necessary to determine whether light emission originates from a single dipole or from an incoherent sum of two degenerate dipoles (« 2D dipole »). 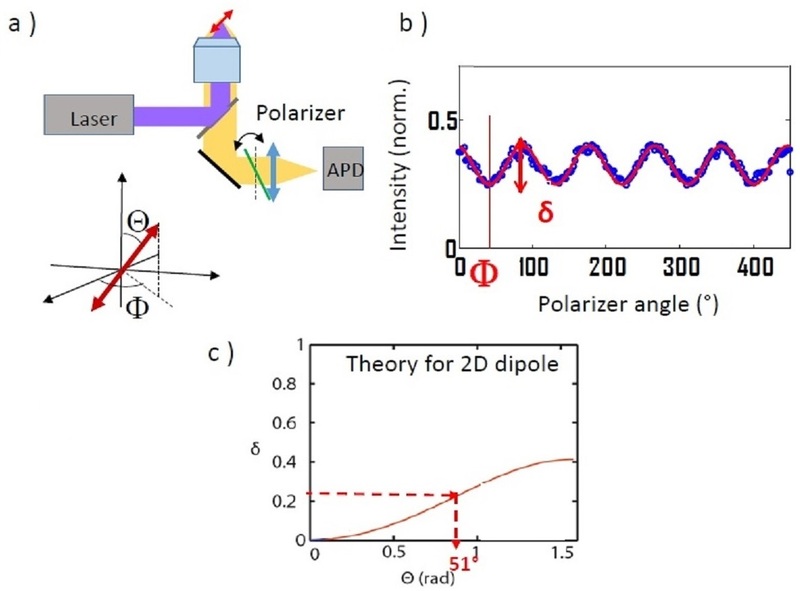 We have established a theoretical description which connects the orientation of an emitter and its 1D or 2D nature to its polarization behavior. 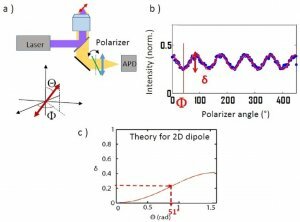 We have shown that the angle between the dipole and the optical axis can be extracted from the degree of linear polarization (provided that the theoretical relation between these quantities is known (fig. 1c), by a model which must include in particular the emitter optical environment and the objective numerical aperture). We applied this method to the study of CdSe/CdS nanocrystals (2D dipoles ; synthesis B. Dubertret) (fig. 1b) and to dot-in-rod CdSe/CdS nanorods (1D dipoles ; synthesis L. Carbone), as well as nanorods oriented by a liquid crystal (collaboration E. Lacaze). Fig. 1 : An example of orientation measurement for a CdSe/CdS nanocrystal (a) Experimental setup schematic and definition of the angles, (b) result of the experimental polarization analysis, (c) theoretical relation between the degree of linear polarization and the angle . The conclusion of this measurement is that = 49° and = 51°, with 4° uncertainty on each angle value.